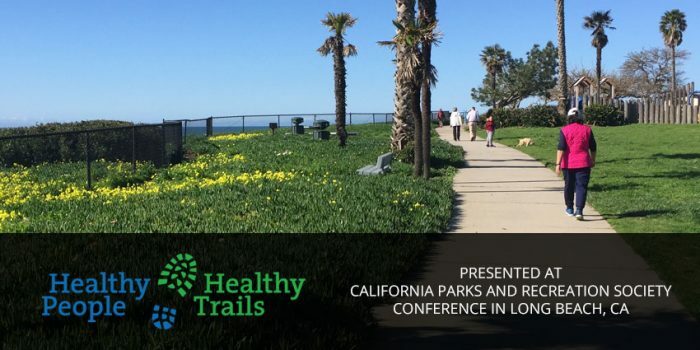 On March 15th Jill Zachary and Mark Wilkinson took the Healthy People Healthy Trails story to Long Beach, CA for a presentation at the annual California Parks and Recreation Society Conference. They spoke to an audience that is well aware that walking and hiking through local parks promotes healthy lifestyles, increases environmental awareness and builds community support for parks and open-space protection. The presentation provided the audience with five steps to create their own version of the Healthy People Healthy Trails initiative that was developed in Santa Barbara County with technical assistance from the National Parks Service. The presentation was grounded in the importance of identifying partners and understanding the mutual needs that the parks and recreation community and the health care community share. Mark and Jill highlighted several similar programs across the country that are part of the national movement. Details about how the Healthy People Healthy Trails initiative is engaging new users with innovative solutions gave attendees additional guidance. The Santa Barbara County program is built on collaborating with a broad array of partners and three tools to make it easier to achieve a healthy lifestyle. Presenters Jill Zachary, Parks and Recreation Director for the City of Santa Barbara, and Mark Wilkinson, Executive Director for the Santa Barbara County Trails Council, are members of the Healthy People Healthy Trails steering committee. © 2019 Healthy People Healthy Trails. All rights reserved.